Technology and Creativity in the FMD Program: 3D Body Scanner | Grand Central Magazine | Your Campus. Your Story. Central Michigan University’s Fashion Merchandising and Design program is ranked 25th in the nation, and 12th in the Midwest, according to CMU. With technologies like state-of-the-art CAD labs, a 3D printing lab and a 3D body scanner, our fashion students learn valuable techniques and skills to promote creativity that are exclusively taught at CMU. We got in touch with Maureen MacGillivray, a Professor in the Fashion Merchandising and Design program, to learn more about the 3D body scanner located in the Engineering and Technology building. The 3D scanner is used to collect measurements on the individual inside, a tool that can help a designer’s process dramatically. The scanner has eight cameras mounted on four posts, along with laser beams that collect 300,000 digital data points. To begin the scanning process, a subject steps in the body scanner, dressed in either tightly fitted clothing or undergarments. Then, they stand with their arms a hip width apart and hands balled into fists, close to the waist. 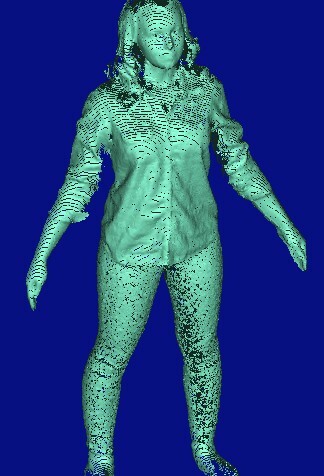 From this position, the scanner detects a body, and gathers over 120 different measurements of the scanned subject, producing a three dimensional virtual avatar on the computer located outside of the scanner. What can fashion students use it for? Students in the fashion program can use the 3D body scanner for design and fitting analysis. Designers for Threads, CMU’s student run fashion show, can also use the scanner to collect measurements for their models. “The main purpose of the body scanner is to collect measurements for tailoring. These measurements include, but are not limited to, shoulder to elbow, waist to hip and center front to waist,” Professor MacGillivray said. Students in the clothing construction course, FMD 140, also work closely with the body scanner. What else can the 3D Body Scanner do? In addition to design and fitting analysis, the scanner is also used to test technologies such as thermo-design and smart clothing. Students in the engineering department also use the body scanner for reverse engineering projects. The body scanner is just one example of extraordinary creativity at CMU, and the steps our school takes to make sure students are top of the line in their field. Next time you want to learn more or get hands on experience with the scanner, take FMD 140 or stop by the Engineering and Technology building to check out what’s currently being worked on. Separator image Posted in Campus Fashion, Student Styles, Style, Style & Beauty, Women's Style and tagged with Carissa LeFevers, Fashion, Fashion Merchandising and Design, FMD, Morgan Wood, Style and Beauty, technology.